Interested in packing light with baby? Be sure to check out part 1 here to see how to pick the right clothing and pack everything you need in a carry-on, for both you and baby! Taking a trip with your family and trying to figure out how to travel light with a baby? I have been traveling carry-on for years and over the past 16 months have added a baby to that equation- without needing to check a bag. Packing everything you need for you and a baby in one carry-on might seem difficult, but starting with choosing the right clothes and being mindful about what baby gear to bring makes it possible to travel light without feeling like you are missing out by not bringing the whole house with you. 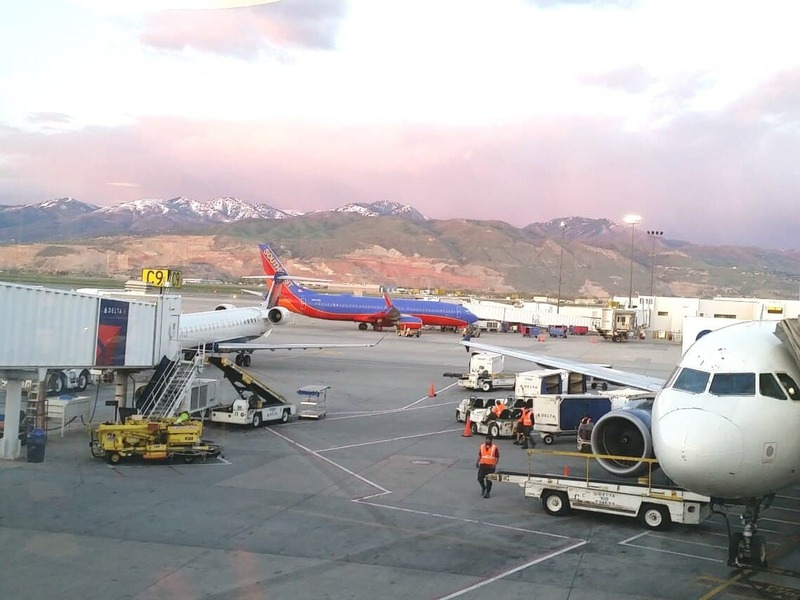 Travel with kids, and especially air travel, is not a walk in the park. Yes, there are tips and tutorials and posts like this one all over the blogosphere about how to make it easier. That is because traveling with kids can be hard! They are unpredictable, often choose the worst possible moment for an explosive diaper, and require a lot of planning. But the good news is that the more prepared you are for a trip, the easier it is—and the more relaxed you will be. Traveling light—in addition to being prepared—is in my opinion, the other most important tip to make a trip less chaotic & more enjoyable. It makes it easier to stay organized during vacation, leaving you more time to relax and enjoy. Being more intentional about the clothing and items you do bring means they are more likely to be worn/used rather than having lots of extra items that prove unnecessary (taking up space and weight). Packing light initially means you can bring an extra tote for souvenirs or shopping trips (I may or may not have a hard time resisting sales;) ). Avoiding checked baggage fees at airports. If traveling carry-on only you can be flexible with flights and earn perks (I have received flight vouchers for willingness to be bumped to a flight an hour later at the gate- which was only possible because I had not checked any bags). And finally, babies require a lot of stuff, so by minimizing the amount of what you bring, you are left with more hands to juggle what needs to be brought! It also makes it easier to travel alone with a baby. A majority of my flights have been just me and my infant daughter—my husband typically either had to travel separately due to work or was unable to go with me to visit family. Traveling light made it easier for me to handle the trips alone. But traveling solo with a stroller, car seat, diaper bag and rolling carry-on took extra patience! After you have figure out the right clothing to pack (with the perfect capsule wardrobe) the next step is to figure out the gear you want or need to bring with you. Let’s be honest—you will probably think about this long before you wonder about clothing. Let’s be honest—you will probably think about this long before you wonder about clothing. Because when we think baby, we think STUFF. Depending on the type of trip or your destination you will likely need different things. Daily necessities such as feeding, diapers, and pumping supplies (if you bottle feed or plan to leave the baby with family during the trip). Keep in mind, the easiest way to pack light is to borrow from people at your destination (if traveling to visit family), or to rent upon arrival. However, that may not make sense in every situation (such as wanting to use a stroller in the airport or hoping to snag an extra seat for your car seat on the plane). 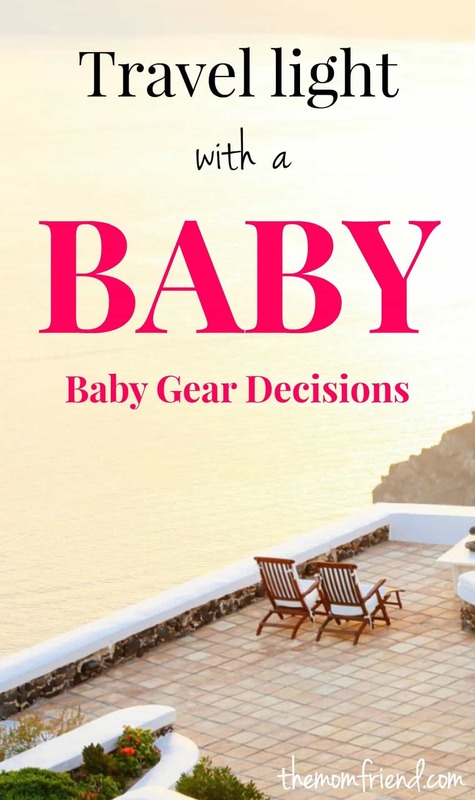 There is a lot to think about when deciding what baby gear to bring. Let’s start with the smaller stuff, shall we? 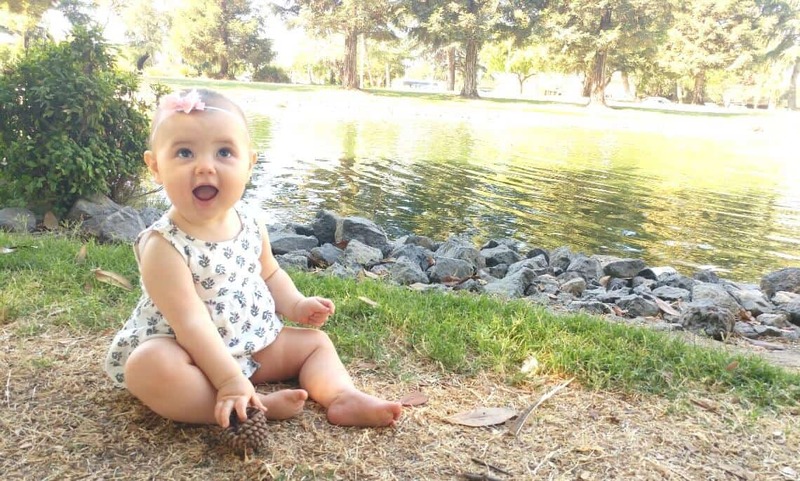 You could probably name 50 things that you use with your baby on a daily basis. Some of those are non-negotiables (such as diapers or bottles), and some we tend to reach for more out of convenience than necessity. It seems I use tons of different things during the day to make our “routine” flow somewhat smoothly, but when I travel, it just doesn’t make sense to bring it all with me. The more I travel, the better I get at identifying which items should go and which should stay. I recommend that you focus on a few things that you just have to have (whether it is a non-negotiable item or you can’t imagine your day without it) and see what items in your bag can multi-task. For example, rather than bringing a sound machine, I use the White Noise Baby App on my phone or tablet for sleeping time. And I only bring enough diapers and wipes for my travel day (plus a few extra) and buy the rest at my destination. Since most newborns go through between 10-12 diapers a day, if traveling is going to take a full day (which is often the case flying cross-country) then I would bring approximately 15 diapers, distributed through my diaper bag and carry-on. Baby needs to eat, so we need to bring the tools to make that happen. Depending on your personal situation, 1-2 bottles, a few bibs, and some burp cloths should be sufficient. Try to minimize the amount and take into account whether or not you will have access to a washing machine. Bring enough formula for travel day + a little extra in case of a delay, and purchase the rest upon landing. Even though I was breastfeeding I always took a bottle or 2 of breastmilk on the plane for times when I was running low on supply or needed to quickly soothe a baby who was too upset to latch. It has saved me many times! Rather than take a nursing cover, I always traveled with a light infinity scarf. They are stylish, a great cover for nursing and/or a sleeping baby, and can be bunched up into a pillow as well. If you are pumping or think you might need to leave breastmilk for the baby while there (such as for a date night out or a well-deserved shopping trip) when you will need to bring your pump along for the ride. It is still possible to travel carry-on only with all your pumping supplies as well! I have traveled solo with just my daughter, using just a rolling carry-on and a diaper bag, and fit all of our clothes plus my double electric pump & supplies. It was definitely a much trickier situation seeing as the pump took up quite a bit of space, but it was doable. A manual single pump would take up less space, though a battery operated pump like this one for travel if I am going to be pumping more than just once or twice. I’ve traveled with all three and prefer the middle ground of the battery operated one. If you are able to attach your bottles to the pump then you can save even more space, or else pump directly into bags to be stored. Breast pumps are also considered medical supplies, so if you are worried about fitting it into your luggage you can carry it on board in as an extra bag that doesn’t count against the bag limit on most airlines (though this adds more for you to juggle). Refer to your airline’s website for any questions regarding medical devices. It’s time to figure out what larger items you will need for your trip, and what the best configuration is to get you, the baby, and all your stuff through the airport and at your destination. Borrowing or renting items is a great way travel light with a baby. Will you be traveling to visit family who may already have or have access to many of the things you need? This can be a major lifesaver if wanting to travel carry-on only, so see what you can borrow to reduce your load. Pack n’ Plays are a great option for a safe place for a baby to sleep, and most people with kids have one hanging around they can loan out. 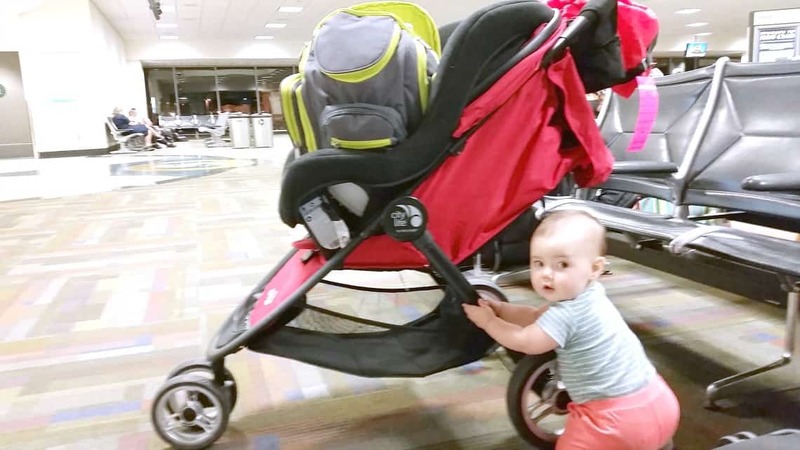 Although both a stroller and a car seat are free to check for practically all airlines, depending on your travel preference you may find it easier to just borrow these large items from friends or family, or rent them at your destination. Most larger cities have companies that will rent baby gear like strollers or pack n’ plays, and you could always choose to add a car seat to your car rental agreement. Are you traveling with anyone else or alone? If alone (which I have done most of the time), remember that you will be hauling everything yourself. While it is possible to bring everything in the picture below, and I felt it was necessary for that trip, it is a lot of to push and pull through the airport, into bathrooms, through security, etc. I gave myself plenty of time and minimized the amount of moving around the airport to make it easier. 2. What will you need (or want) to gate check? Strollers and car seats must be gate checked unless you have either purchased a seat for your child or are lucky enough to score a free seat by talking to the gate attendants. Car seats will not fit in the overhead compartment, so don’t try. I recommend getting a stroller/car seat bag for your gear if you are worried about the fabric getting dirty or damaged. Gate checking means less handling than checking these items with regular luggage, but it is definitely possible to do that if you prefer to not carry them through the airport with you to begin with (bonus tip- both check for free!). 3. What are you going to do with the baby when you need a free hand? I highly recommend always traveling with a carrier of some sort, to leave your hands free to handle the other stuff. A lightweight stroller would also work well, but the carrier is extra helpful when boarding/ exiting a plane. If it seems like too much to maneuver on your own, or too burdensome to haul through the airport, then go ahead and check some of it or even all of it. There is no shame in doing that. Even though I pack light, I’ve checked my carry-on bag on a flight before, once as a free bag, and once I even paid for it because I just didn’t feel like carrying it around. No big deal! I was on my way home so I wasn’t worried about whether or not my bag got delayed and just felt like having less stuff would make a tight connection simpler. By still using the technique of packing light, however, it made it easier to make that decision on the fly, as well as getting the stuff to and from the airport. Going carry-on only isn’t about seeing how much stuff you can cram into a smaller suitcase (I try to always have room to spare). I pack light because it gives me more time to relax and enjoy my vacation, without being burdened with a lot of “stuff”. Most trips I come away with still having pieces of clothing I or the baby haven’t worn (despite using a capsule wardrobe), along with toys or baby accessories that were never used. I am always working to refine my packing list to the perfect amount. Each trip will be different, and each baby requires different things. Now that Charlie is a toddler I will be reworking my methods especially for the airport because she LOVES to run around. I can’t see chasing her with a stroller and rolling suitcase while traveling alone to be a good idea. Above all, give yourself some grace. If you utilize even just one or two methods of packing lighter, it is better than none! What are your must haves for traveling with a baby? Do you have any tricks for packing light? I’d love for you to share them in a comment below!